Many ultimaker 2 issues I can't solve, not sure if any are related. 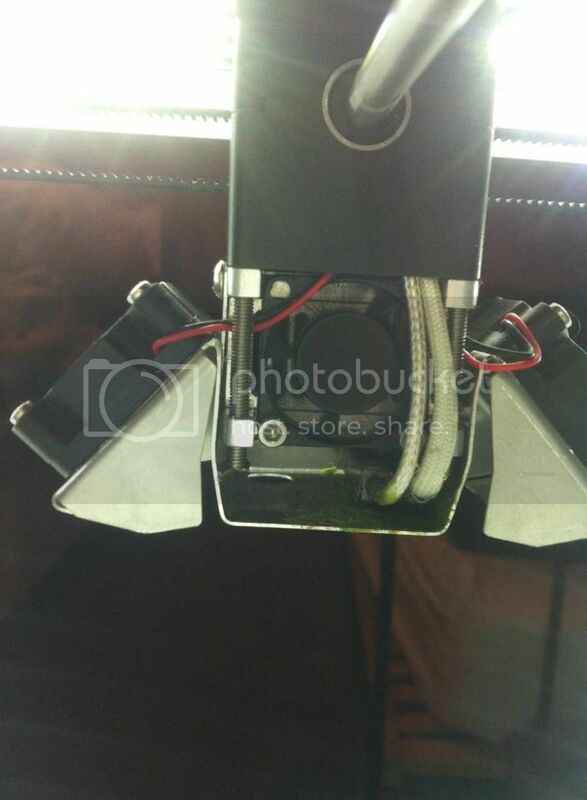 -Red flashing light when printer is on; looking at (if following 'diagram' is printer from directly infront) [_] the left hand side, just left of and below the leftermost bottom screw; light is inside casing and judging by sihouette, behind some wires. -On the menu settings-maintenance-advanced-move material, scrolling the wheel in any direction doesn't move the wheel at the back, so can't test it. -No filament can be forced out of the nozzle by any force I can exert. If there are many steps to try, please detail any terms that might be obscure. I wrote this out before and (I think) forgot to hit post, but if I did hit post and the post just hasn't been approved yet, apologies. Poor printer, it was doing so well until today. Ultimaker 2, was working fine until today. Latest Cura and firmware as of today. 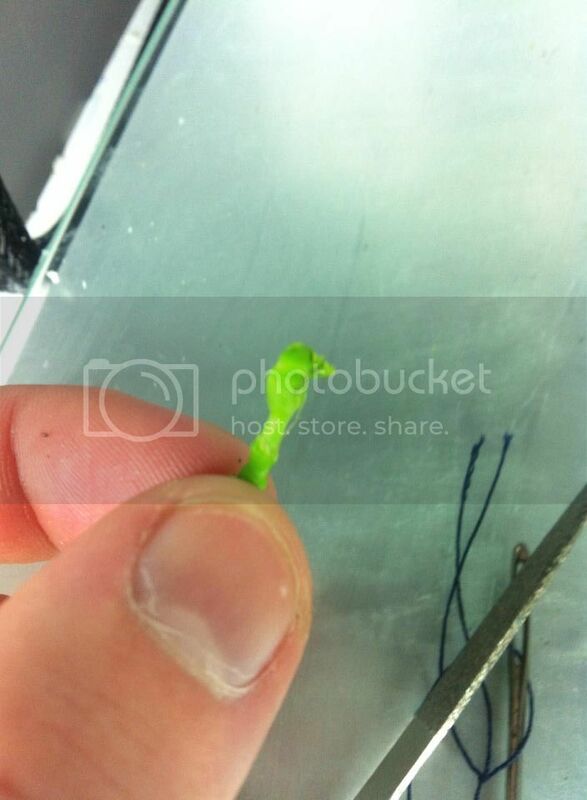 Using green PLA from Ultimaker. Printer is preassembled and about two months old. Had a few issues in past but never ones I couldn't fiddle out quick. The flashing light may just be showing that the heaters are powercycling on and off to maintain temperature, and is probably nothing to worry about. Does the bed and nozzle get hot? The move filament setting should only try to move the filament once any heating etc has completed. That was a recent change, and might even be buggy still. Can you confirm the version number reported for the firmware (Maintenance -> Advanced -> Version - not sure of the exact name, but its in that menu somewhere towards the bottom)? Both nozzle and bed heat sufficiently, and after leaving it to heat up fully and get stable, the extruder wheel does turn but no filament comes out/moves at all. When you want to use the move material option try to move the printhead by hand first. If not easily moveable turn the printer off and on again. Now you should be able to move the printhead easily and use the move material option properly. Problem is the Ultimaker thinks the last command is not done yet and blocks every movement. The Red Lights are probably nothing to worry about as illuminarti said. For the filament grinding issue.... if you try to force it through the Feeder by hand it will naturally be grinded. If done through motor movements try to play with the force the wheel is pressing against the filament. I would say try reducing it first. This "This post will need approval from a moderator before it is shown. This restriction will be lifted when you have 2 more approved posts" is really starting to annoy me, means I can't reply with any speed. Etc, the grinding is an issue caused by something other than me forcing it, how do I alter the force of the wheel? Sorry about the posting restriction. You should be good to go now, since you're up to 6 posts!! If the filament is getting ground, it's probably best to remove it and cut off the damaged part, and reinsert it; the damaged part could later get caught in the extruder, and do more damage. You can adjust the tension on the extruder by inserting a screw driver into the hole in the top of the feeder block - as you turn the screw, the little white indicator block should slide up and down. Higher is lower tension. It could be that you have too much tension, or not enough, to be honest. But usually, the default position is fine, so I suspect its something else. 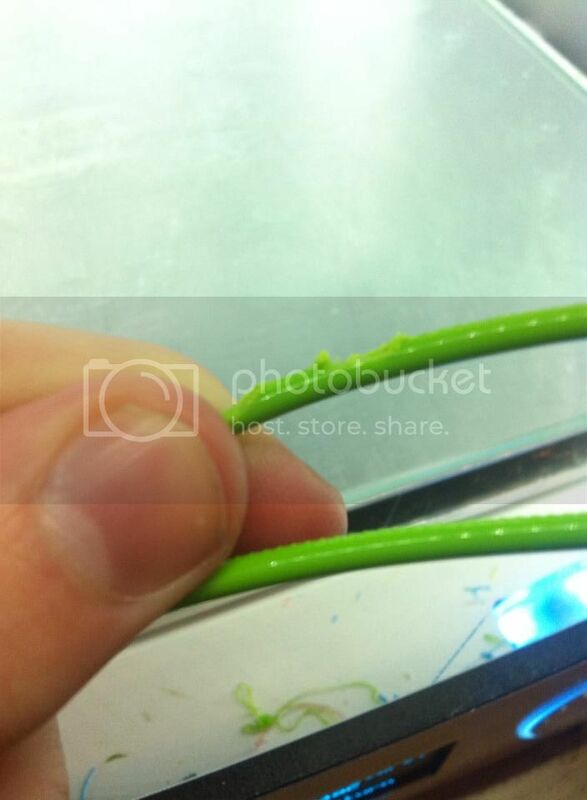 The first thing to check is the diameter of the filament. Do you have a means to measure it? It should be less than 3mm - about 2.85 ideally. Ultimaker filament should be reasonable quality, but just in case not, it would be good to check. If it's too thick it might get caught in the Bowden tube. Then you need to check the assembly of the hot end, and make sure nothing is loose. And everything is properly adjusted. Is the Bowden tube fully inserted into the white part behind the sprint on the hot end? Does it move at all during printing? Next, you should try heating the head to 250, letting it sit for jsut a few minutes, and then try moving the filament using the controller again. This might soften some filament that got stuck somewhere and allow it to get pushed through. The worst case scenario is that there is some debris clogging the nozzle. In that case, you might need to disassemble everything. 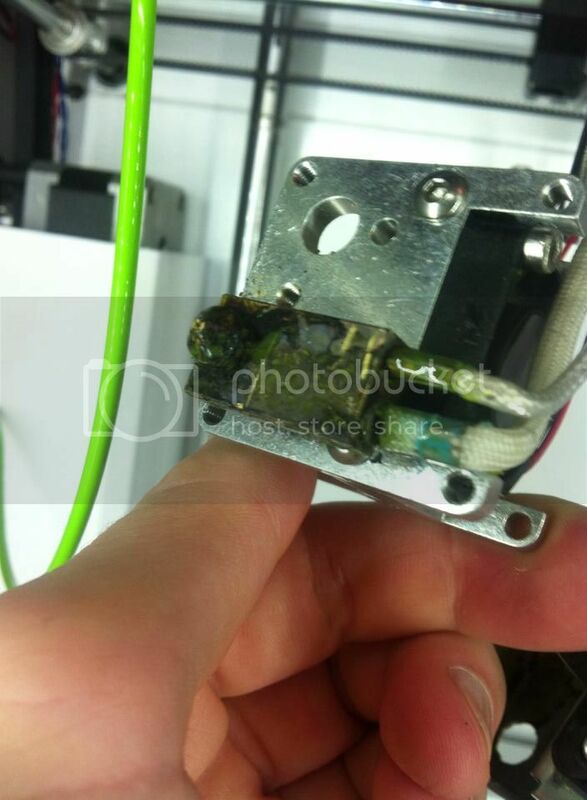 Perhaps posting some clear, close-up photos of your extruder and hot end might be a good start, so we can see if everything looks ok. I've cut off two chunks with ground up bits now but doesn't help, more just gets hurt. I'll try the tension adjuster later today (just past midnight here, won't get a chance till after 5pm), it's in the default at the moment. I've got some digital callipers Ill use to measure the filament, and I'll try the other things as well as soon as I can. I have let it sit at 260 and nothing changed, might try again later. I feel from what you said, the issue might be a completely clogged nozzle but it would be a very sudden change from clear to entirely clogged, is that possible? Ill post photos if nothing else works as disassembling the print head bit would be a lot to go through if there's a visible issue I can't spot. The diameter of the filament is a real issue. It must measure 2.85mm. If it is 3mm it will get caught in the Bowden tube. I have 3mm Formfutura filament and , for instance, the frosty white does not work at all. In my case, the major problem of UM2 underextrusion and filament grounding is the Bowden tube. In order to get the excellent retraction mentioned by Iluminarti , the Bowden tube must be in the right place and very well adjusted. My problem is with the plastic white clip that supports the tube but, breaks very easy. 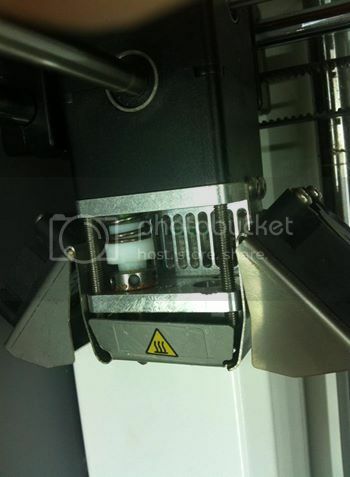 In the feeder side, one of the clip “legs” break and was obstructing the filament making it ground. On the nozzle side the clip is also missing “legs” and does not keep the end of the Bowden tube close to the nozzle. As the filament force to extrude/retract, the tube comes out making a big mess . Immediately, the printer starts under extruding . Also, the tube out of place might retract hot filament from the nozzle and clog the tube exit, not the nozzle. I already sent a ticket to Ultimaker and they are sending me some new clips. In order to keep printing, I am using some tape to keep the tube in place, but it only works for a limited time. Filament varies from 2.88 to 2.82 on the random bits I measured. Nothing seems loose as far as I can tell. I've tried heating but nothing happens, not even some filament dripping down. My presumption would be blocked nozzle, but I'll post photos first before attempting any disassembly. 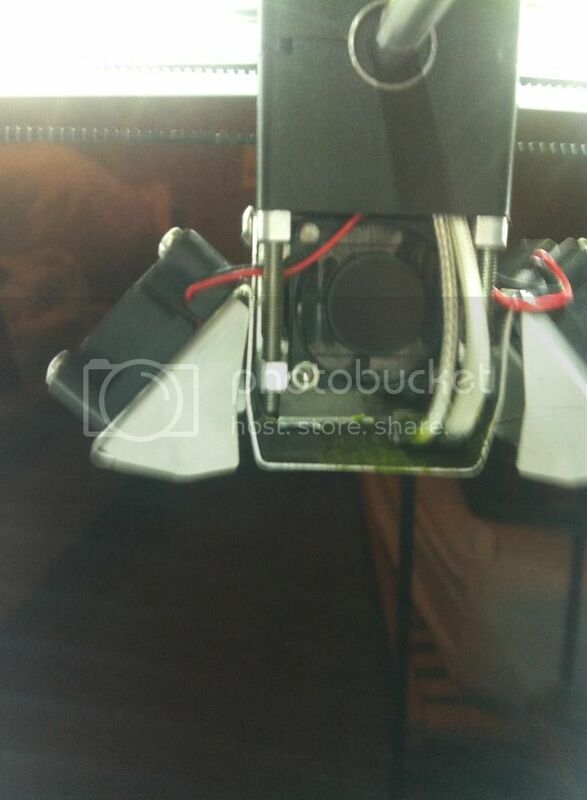 Any green stuff around printhead is because a few days ago a print came loose and stuck to the nozzle and spread all around, mostly clear now, and if it is an issue, it'd be a bit in the nozzle. If photos too big and a mod can edit to resize them, please do! That's definitely some very badly chewed filament. I don't see anything obviously wrong in the photos. You might try removing and re-seating the Bowden tube - peer down into the teflon and see what it looks like - but it does seem that something is very wrong with the hot end, for all extrusion to stop, and grinding to be that bad. If there is any damage to the filament though - as is visible in the bowden in the first photo, that will probably stop it going into the teflon part, so be sure and try one last time with fresh filament. I don't have any filament apart from the reel currently on the back, and I've tried fresh lots of that a fair few times, so should where should I refer for cleaning the nozzle, is there a detailed guide? Currently using "dip filament in to scoop up blockage" technique to clean nozzle and will attempt to push a wire through as well. 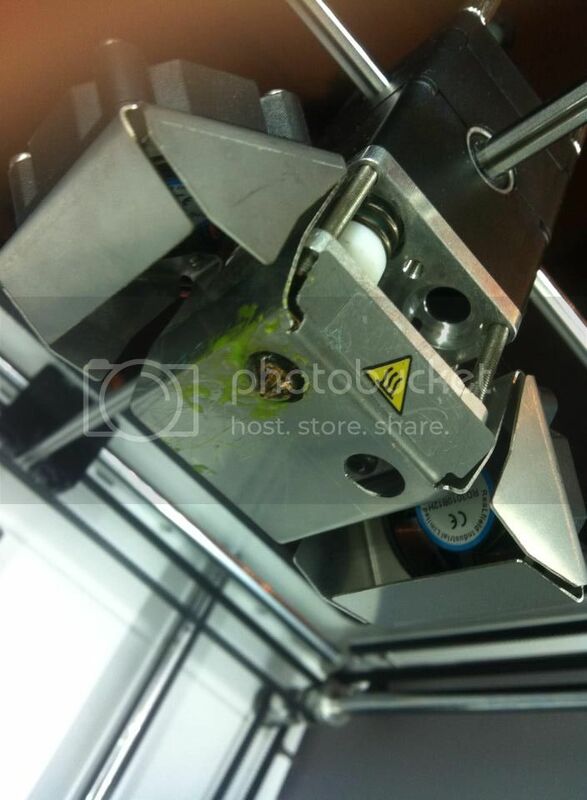 I guess my point was, any time the filament gets damaged, take it out and discard the damaged part. Trying to push damaged filament through the printer is never going to end well, and could permanently damage the printer. I've been dipping in filament and then using various sewing/medical needles with diameters down to 0.35 to try and clear but even the smallest needles won't go up the nozzle and won't read down, any advice? Are you doing this with the nozzle hot? The hole in the nozzle looked ok in your photos, so somehow you should be able to push out of the way whatever is obscuring the hole inside. 2 more photos with nozzle again and filament that has been pushed in and cooled and out, all clean, no bits to latch onto? Nozzle has been at 260 when trying. Looks like there's a lot of carbonized goop on the outside of the heater/nozzle. I guess that's what's also causing the problem inside. Did you ever run any other type of filament through it - or did the nozzle ever get really hot for quite a long time? Any temp warnings or anything? Your only choice I think is to try and force out whatever is blocking the hole. You said you had a needle that fit in the hole - how far does that go inside? Perhaps you could tap it gently with a hammer to try to displace whatever it is. If you have a 3mm drill bit, or thereabouts, maybe you could try inserting that from the other side, and turning it gently... see if you can disturb the blockage from the other side - but be gentle. I'm beginning to think that you might need a new nozzle however, as it does seem rather solidly blocked. That is mostly from prints where the plastic got caught at the nozzle and spread, but it does seem very stuck. I used ABS for a short while but didn't like the colour/smell from printing so swapped back, pretty much only used ultimaker PLA. I have left the printer hot for times quite a lot, and I've had lots of temp warnings due to the abs bug where it was set to 280 as default. the needle will go in a tiny bit, but barely noticeable, the needle just slides a bit into the nozzle, enough to not slide but not in. the needle is really bendy, I can try though. I'll look into the drill bit, would I be able to find a new nozzle just by googling "UM2 nozzle"? just to clarify, you printed PLA with 260-280C? Success! Tiny 0.35mm syringe made it through the nozzle at 260 C after lots and lots and lots of poking at both ends with filament and needles and so on! then tried a bit of filament, went through easily, will slowly and carefully test machine in morning (have been made to stop tinkering) to make sure it all goes back together and works fine, but currently looks good! Any advice on maintaining a healthy printer in light of the currently solved issues? If not, hopefully I won't be back here for a while. I suspect you had a bit of stray ABS that cooked in the chamber. The main advice at this point would be to be very careful when switching back and forth between the two to make sure that you flush all of the ABS out. 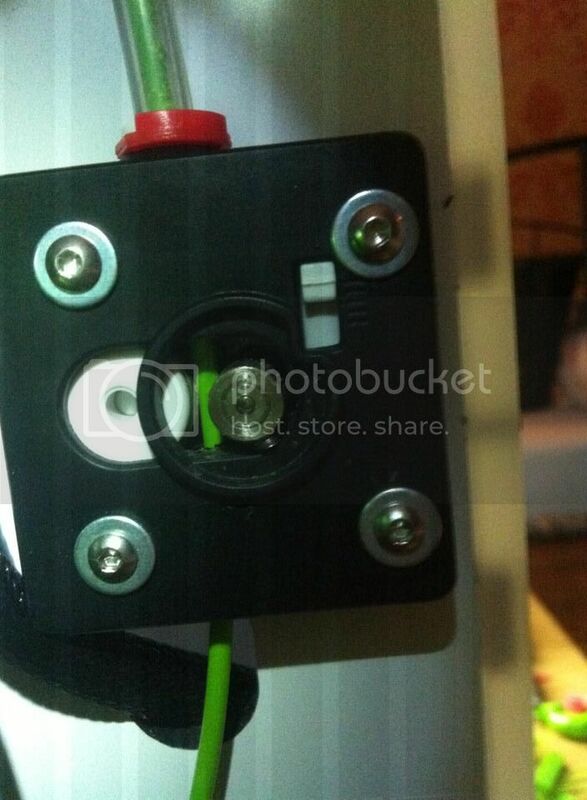 Keep it on ABS settings, and manually advance the filament to flush out the ABS. Let it sit a few mins, and repeat the exercise. DO it a few times, so that there's not much chance of any ABS getting left behind and then cooled to normal PLA temps where it doesn't flow very well at all. Ooh okay, I'll stick to PLA most likely, I think the green ultimaker PLA is a very nice colour so I'll get though a few reels of that before I consider anything else.